Phenotype of CCR2+ myeloid subsets. (A) Morphology of CD11b+CCR2+ myeloid cells sorted from spleen and pancreas of P1 WT mice stained by Wright-Giemsa (n = 3). (B) Flow cytometric analysis of pancreatic and splenic CCR2+ cells for myeloid cell markers. Vertical gray lines mark background fluorescence of IgG controls. Representative of n = 4 experiments. 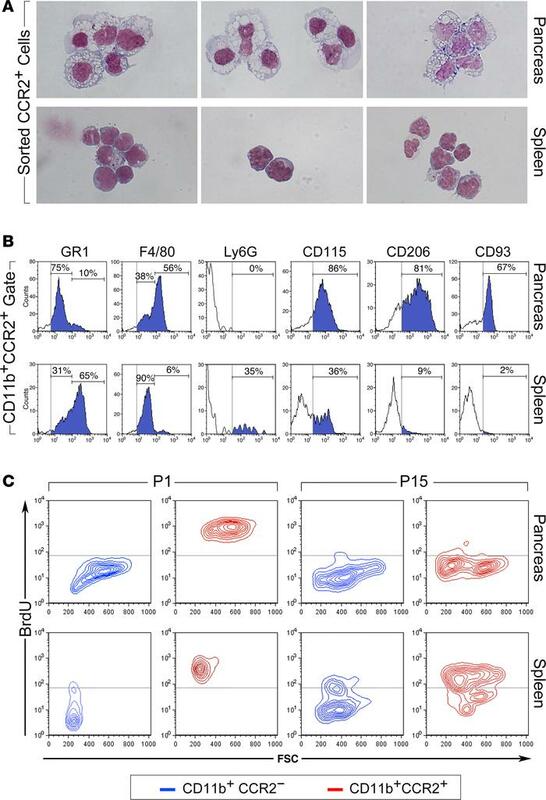 (C) Flow cytometric plots showing the fraction of BrdU+ cells detected in pancreatic and splenic CD11b+CCR2+ and CD11b+CCR2– subsets from P1 and P15 newborns after a 16 hours pulse in vivo (n = 4, using pools of 3–4 tissue samples).